Bacterial metabolism is comprised of primary metabolites, the intracellular molecules of life that enable growth and proliferation, and secondary metabolites, predominantly extracellular molecules that facilitate a microbe’s interaction with its environment. 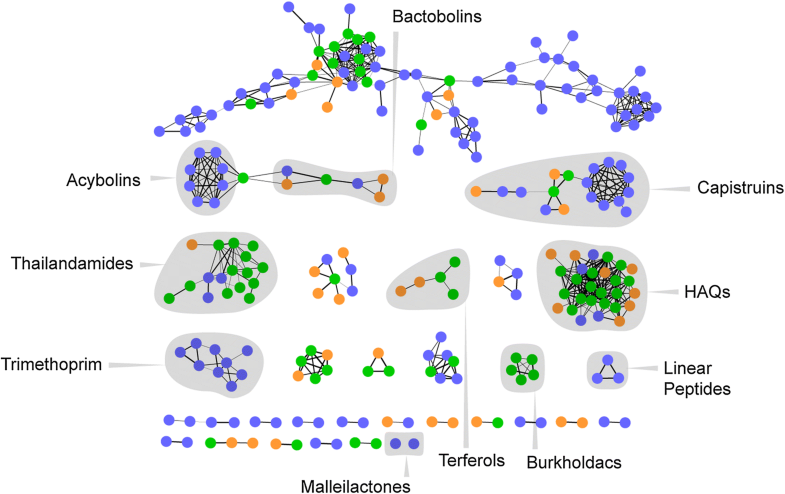 While our knowledge of primary metabolism and its web of interconnected intermediates is quantitative and holistic, significant knowledge gaps remain in our understanding of the secondary metabolomes of bacteria. In this Perspective, I discuss the main challenges involved in obtaining a global, comprehensive picture of bacterial secondary metabolomes, specifically in biosynthetically “gifted” microbes. Recent methodological advances that can meet these challenges will be reviewed. Applications of these methods combined with ongoing innovations will enable a detailed picture of global secondary metabolomes, which will in turn shed light onto the biology, chemistry, and enzymology underlying natural products and simultaneously aid drug discovery. Bacterial metabolites are typically divided into two categories, primary and secondary. Primary metabolites are the molecules of life, the sets of molecules that bacteria use to derive energy and to build the precursors, cofactors, and biological polymers that enable growth and proliferation. These molecules dominate exponential phase growth. They are found inside the cell and are usually charged to prevent diffusion through the cell membrane(s). Secondary metabolites, on the other hand, are predominantly extracellular, low molecular weight compounds that facilitate the interaction of a microbe with its environment. Because they must pass through the cell membrane of not just the endogenous host but, in some cases, also the target organism, they are typically uncharged and non-polar. Secondary metabolites can be produced throughout bacterial growth but usually dominate late-exponential and stationary phase lifestyles. Work over the past century has provided a detailed, quantitative, and holistic picture of primary metabolism [26, 69]. This kind of understanding is not yet available for secondary metabolism. We do not know how vast it is; the complete secondary metabolome has not yet been elucidated for any prolific or biosynthetically “gifted” bacterium [1, 2]. But with recent technological advances in mind, we may ask, are these insights attainable and what are the challenges involved in doing so? A comparison with primary metabolism is especially useful here: Primary metabolism is required for growth and proliferation. As a result, all major metabolic pathways are active, and the corresponding enzymes are typically robust and expressed at high concentrations inside the cell. That is not the case for secondary metabolism. It is not required for growth, and most secondary metabolite biosynthetic pathways are off—that is, the corresponding biosynthetic genes are not expressed—under normal growth conditions in the laboratory. These genes or gene clusters are referred to as “silent” or “cryptic” [1, 31, 42, 43, 52, 55]. To paint a clearer picture of secondary metabolism, similar to that of the primary counterpart, methods that activate silent biosynthetic gene clusters (BGCs) need to be developed. A second key differentiator is that primary metabolism consists of a plethora of interconnected intermediates. This vast web facilitates isotope tracer studies, the identification of previously unknown intermediates, and the elucidation of new primary metabolic pathways. Secondary metabolism is again different in this regard. Within a cell, the pathway for each secondary metabolite is unrelated to that of the next. Most pathways, those of non-ribosomal peptides or polyketides, do not even contain diffusible intermediates because of the assembly-line mechanism by which they are generated . Therefore, primary metabolism tends to be specific, converging to a few known end-products. The Trp biosynthetic pathway, for example, only makes Trp and not any Trp analogs. By contrast, secondary metabolism is promiscuous and diverges to many unknown end-products . The erythromycin biosynthetic pathway makes erythromycin A through D with additional variants at lower abundance [21, 34, 35, 47, 95]. Therefore, the major challenges that need to be addressed are the silent nature of secondary metabolism and the ability to study, both chemically and biologically, many divergent natural products. These two aspects are further elaborated below, before discussing possible solutions. The advent of next-generation sequencing (NGS) methodologies coupled with advances in bioinformatic analysis was instrumental in uncovering the silent nature of most secondary metabolite BGCs. The examples of Streptomyces coelicolor and Streptomyces avermitilis provide illustrative cases [4, 29]. S. coelicolor, the archetypal streptomycete model strain, was the first to be fully sequenced, and its genome revealed 18 previously unanticipated secondary metabolite BGCs . In years that followed, compounds were associated with many of these BGCs, demonstrating a prolific capacity for natural product biosynthesis . 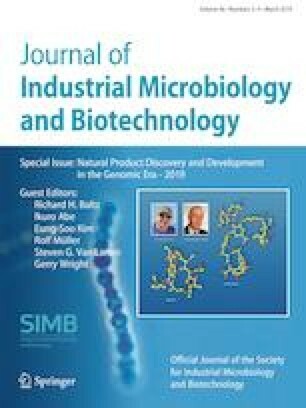 The genome of Streptomyces avermitilis reinforced lessons learned from that of S. coelicolor. S. avermitilis is the industrial producer of avermectin, discovered in 1979 [9, 12, 16, 20]. Medicinal chemistry efforts ultimately led to ivermectin as a globally-used antiparasitic agent for which half of the Nobel Prize in 2015 was awarded. Even today, avermectin is not synthesized, but rather isolated from massive-scale fermentations of S. avermitilis. The biosynthesis and mode of action of avermectin is fairly well-understood, and its BGC was ultimately identified before the NGS revolution. But much like the S. coelicolor genome, the fully sequenced genome of S. avermitilis unveiled a tremendous capacity for natural product biosynthesis beyond that of avermectin . It revealed dozens of other BGCs that had no products associated with them. S. avermitilis had been cultured for decades on massive scales and yet its potential to produce dozens of other metabolites had gone entirely unnoticed. These BGCs are now referred to as silent or cryptic. They can be easily spotted bioinformatically, but for unknown reasons do not give rise to appreciable levels of natural products under normal growth conditions in the lab. As additional bacterial genome sequences accumulated—for example that of Saccharopolyspora erythraea, the industrial producer of erythromycin —it became clear that silent BGCs were not the exception but rather the norm. Moore and colleagues provided an early, insightful report of the abundance of silent BGCs in well-known actinomycetes . Similar analyses have followed for myxobacteria, Burkholderia spp., and other bacterial phyla [1, 31, 42, 43, 52]. The current consensus is that only 10–20% of BGCs give rise to detectable levels of a secondary metabolite under standard laboratory conditions. Current methods cannot access the products of most natural product BGCs. It therefore stands to reason that strategies, which can “awaken” silent BGCs, will advance natural product research and, given the impressive track record of these compounds as pharmaceuticals, facilitate drug discovery efforts. The second key challenge in advancing our understanding of secondary metabolism involves the study of many structurally divergent secondary metabolites. Almost every class of well-known natural products may be chosen to demonstrate the diversity-oriented nature of secondary metabolism. Consider the hydroxyalkylquinolines (HAQs) that are known to be produced by pseudomonads, Burkholderia spp., and some actinomycetes (Fig. 1) . Even before the advent of next-generation mass spectrometry techniques, more than 50 HAQs had been discovered from Pseudomonas aeruginosa alone [24, 39, 40, 78]. Their structures were elucidated using a combination of approaches, including HPLC–MS, GC–MS, comparison to synthetic standards, UV absorption spectroscopy, and NMR. The biological activity of most HAQs, however, has yet to be demonstrated. The few that have been examined in detail, revealed surprising results. For example, while the Pseudomonas quinolone signal (PQS) acts as a signal in the quorum sensing (QS) hierarchy of P. aeruginosa, positively regulating its own expression and that of several virulence factors (such as elastase and pyocyanin), HQNO (2-heptyl-4-hydroxyquinoline-N-oxide, Fig. 1) acts as an antibiotic by inhibiting energy production pathways in other bacteria [10, 23, 67, 70, 80]. Different activities have also been reported for the precursor of PQS, HHQ (2-heptyl-4-hydroxyquinoline, Fig. 1), which aside from positively autoregulating the pqs operon also activates the rhl QS system in P. aeruginosa . Thus, analogs that are minimally altered from a structural standpoint, exhibit highly divergent biological activities. A similar picture has emerged in Burkholderia thailandensis. Again, dozens of HAQs have been identified [64, 83]. Detailed examination of the function of two HAQs has provided some surprising insights into the synergistic function of HAQs as well as their targets in microbial cells. The most abundant HAQ in B. thailandensis, HMNQ (4-hydroxy-3-methyl-2-nonenylquinoline, Fig. 1), has dual targets: it dissipates the proton motive force and also inhibits dihydroorotate dehydrogenase (DHODH), an important enzyme involved in pyrimidine biosynthesis, by competing for the enzymatic ubiquinone binding site . HQNO, also produced by B. thailandensis, similarly exhibits polypharmacology: it inhibits cytochrome bc1 as well as DHODH [23, 70, 80, 89]. Together, HMNQ and HQNO exhibit multiple degrees of synergy: They target energy generation at two stages and thereby form a formidable antibiotic cocktail. At the same time, each molecule also inhibits DHODH, thus restricting access to essential pyrimidine nucleotides. Clearly HAQs are privileged scaffolds, as small structural alterations lead to new biological activities. This conclusion is further supported by the fluoroquinolone family of antibiotics (Fig. 1). Though of synthetic origin, relatively simple structural modifications with respect to natural quinolones impart inhibitory activity toward DNA gyrase and thereby potent antibiotic activity. As noted in the Introduction, solutions to the silent and divergent nature of secondary metabolism are required to provide deeper insights. Possible methods and their applications will be discussed next. That silent BGCs represent a treasure trove of new natural products has been recognized by the research community, and a variety of methods have been developed for inducing them. Excellent reviews are available that summarize the methods utilized thus far [1, 46, 62, 63, 71, 72, 74, 81]. In this section, the HiTES (high-throughput elicitor screening) approach will be reviewed along with its application to diverse microorganisms and its integration with other methods to address the silent and divergent nature of secondary metabolism . HiTES addresses a key unknown aspect of silent BGCs: induction via exogenous signals. In HiTES, a reporter gene is inserted into the silent BGC of interest to provide a rapid read-out for its expression (Fig. 2). Next, high-throughput elicitor screening is carried out, using a library of functionally and structurally diverse metabolites, and the effect of each compound from the library is measured on the expression of the reporter gene. Small molecules from the library that act as elicitors are then tested further to identify both the product of the silent BGC as well as the mechanism of induction . Nodwell and colleagues used this approach with a colorimetric read-out, taking advantage the intense blue color of actinorhodin . We have applied it more generally by employing genetic reporters fused to any BGC of interest. Regardless of the read-out, by chemogenetically eliciting cryptic metabolite biogenesis, HiTES allows both the small molecule product and the endogenous regulation of silent BGCs to be assessed. We first applied HiTES to the silent malleilactone BGC (mal) in B. thailandensis as a proof-of-concept case . The product of the mal BGC had previously been determined by the Brady and Hertweck groups using chromosomal insertion of active promoters (Fig. 1), but whether/how its expression could be induced in the native host was not known [7, 19]. Application of HiTES allowed us to identify nine elicitors from a library of 640 compounds that resulted in three-fold to ten-fold induction of the mal reporter activity (Fig. 3) . The identify of these compounds was surprising: the two best were trimethoprim and piperacillin, both clinical antibiotics. The next best two were cefotaxime and ceftazidime, both cephalosporin-type clinical antibiotics. And the next five were all members of the fluoroquinolone family of antibiotics. All these antibiotics kill B. thailandensis at high concentrations. But at the sub-inhibitory concentrations used in the screen, they appear to exercise the opposite effect: they stimulate, rather than inhibit, metabolism. This property, a dual, contrasting response by the same molecule contingent upon the concentration regime, is referred to as hormesis. The hormetic properties of antibiotics were previously noted by Davies and colleagues with regards to gene expression in model organisms [14, 15, 94]. Our HiTES results showed that these hormetic properties extend to the activation of silent BGCs in diverse microorganisms (see below), and that well-known antibiotics could therefore be used to find new, cryptic natural products. Antibiotics as elicitors of cryptic metabolites. Application of HiTES in B. thailandensis revealed predominantly antibiotics as inducers of the silent mal BGC. Each bar represents the level of expression of the mal cluster in the presence of a single metabolite from a small molecule library. The green bars represent the level of expression of the mal cluster in the absence of any elicitors (−) or the level of expression of a constitutively active gene (+), as comparison. Bars representing the best two elicitors are shown in red (trimethoprim and piperacillin) followed by orange (ceftazidime and cefotaxime). The next best five elicitors (blue bars) are all members of the fluoroquinolone antibiotics (color figure online). Follow-up studies with trimethoprim and piperacillin revealed significant induction of the mal BGC as determined by RT-qPCR. Moreover, metabolic profiling showed abundant levels of malleilactone A, and a new derivative malleilactone B, produced only in the presence of the two antibiotics in an elicitor-concentration-dependent manner (Fig. 2) . These results validated the use of the HiTES approach in eliciting cryptic metabolites and in identifying unsuspected metabolites as inducers of silent BGCs in bacteria. With the successful application in B. thailandensis, the approach was next applied to additional BGCs in B. thailandensis and in actinomycete bacteria. Streptomyces spp. are the most prolific producers of secondary metabolites and also harbor an abundance of silent BGCs, as noted above [1, 55]. To extend HiTES to streptomycetes, we chose a large non-ribosomal peptide synthetase gene cluster in Streptomyces albus, which we call sur and to which a compound had not been associated . We bioinformatically identified a single promoter that appeared to be driving the expression of the four NRPS genes, surA-D. A triple-eGFP (eGFPx3) reporter was inserted in front of this putatively silent Psur promoter. A second construct was also generated in which the Psur promoter, driving the expression of eGFPx3, was incorporated into a neutral chromosomal locus. Subsequently, HiTES was carried out using a 502-member natural product library leading to the identification of the DNA gyrase inhibitor etoposide and the antiparasitic agent ivermectin as the best elicitors of the silent sur cluster . Both elicitors transcriptionally induced the sur cluster and triggered an enhanced metabolome. Etoposide was toxic at high concentrations, providing another example of a cytotoxic compound that, at low titers, activates silent BGCs. Comparison of the metabolic profiles of wt and Δsur S. albus strains, both grown in the presence of the elicitors, facilitated identification of the products of the sur cluster. 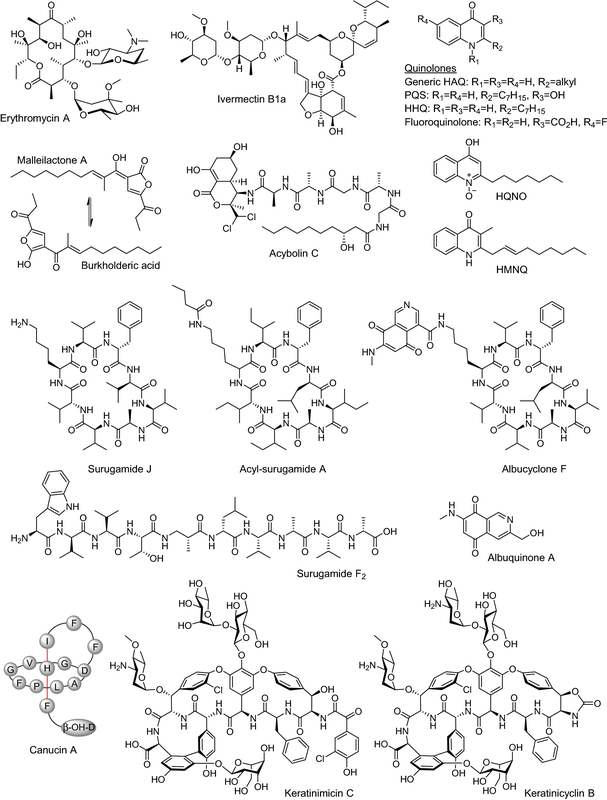 Isolation and structural elucidation by 1D/2D NMR led to 14 new cryptic metabolites. In line with the discussion above, the output of the sur cluster was highly divergent, giving rise to four different compound subfamilies, consisting of the cyclic octameric surugamides, the acylated surugamides, the albucyclones, which likely are products of crosstalk between the sur and another silent BGC in S. albus, and the linear decameric surugamide F variants bearing an unusual β-alanine residue (Fig. 1). Surugamide A, D, and F were previously isolated form a marine streptomycete; all other analogs were new [61, 77, 90]. Also, in line with the discussion above, etoposide and ivermectin globally enhanced secondary metabolism, rather than specifically inducing the sur cluster. Indeed, preliminary investigations of this metabolome led to the identification of albuquinone A, a new natural product elicited by etoposide with an unusual isoquinoline quinone moiety (Fig. 1). A variant of albuquinone A, or a biosynthetic precursor, may provide the unusual “side-chain” component observed in albucyclones. The studies above extended the HiTES approach to actinomycete bacteria. HiTES and other available methods have provided practical solutions for inducing and discovering the products of silent BGCs, the first key challenge mentioned in the Introduction. Applications of HiTES in both B. thailandensis and S. albus, aside from the hormetic functions of antibiotics, have brought another common feature to the fore: small molecule pleiotropy. In both cases, trimethoprim and etoposide did not act as specific elicitors of the mal and sur BGCs, respectively, but rather as global inducers of secondary metabolism . Detailed metabolomic approaches were conducted with B. thailandensis, demonstrating that trimethoprim induced production of > 100 distinct natural products that were not present in the untreated sample, thus verifying the global effect on secondary metabolism. Solving the structures of > 100 distinct metabolites presents a daunting task. How can this process be simplified? The MS/MS networking method developed by Dorrestein and coworkers provides an elegant method for organizing and dereplicating large groups of metabolites [22, 86, 87]. In this approach, untargeted MS/MS data are collected on the desired sample. The data are then computationally assessed to generate a map that groups together compounds that have related MS/MS patterns. The molecular families that are generated are structurally related, usually arising from the same BGC. An image of the MS/MS network of supernatants from trimethoprim-treated and untreated B. thailandensis cultures is shown (Fig. 4) . 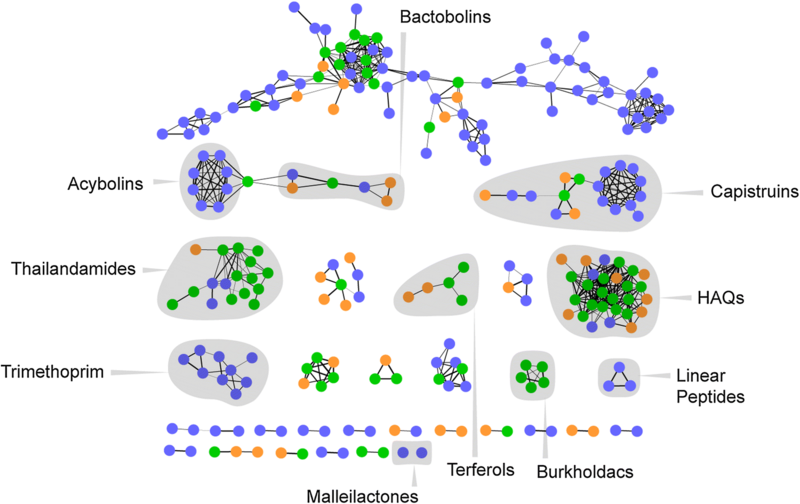 The network revealed that several molecular families are synthesized only in response to the antibiotic, consistent with metabolic profiling studies. Using the HR-MS and HR-MS/MS data, several molecular families could be annotated, including capistruins, HAQs, burkholdacs, terferols, thailandamides, and bactobolins (Fig. 4) [3, 5, 6, 11, 36, 37, 53, 59, 76]. In cases, where multiple fragments were observed and the basis for fragmentation was well-understood, structures could be assigned to individual nodes within a molecular family, without the need for tedious isolation and structural elucidation by NMR. This exercise was especially fruitful with the HAQs, where eleven structures could be elucidated, several of these new to B. thailandensis . The structures of two capistruin analogs , lasso peptides produced by B. thailandensis, could be inferred in an analogous manner . MS/MS network of the trimethoprim-induced metabolome of B. thailandensis. Blue, orange, and green nodes represent metabolites produced only in the presence of trimethoprim, only in its absence, or in both conditions, respectively. Molecular families identified are shaded and labeled (color figure online). The network also prioritized the search for new compounds. Focusing on molecular families with “blue” nodes (indicating they are only produced with trimethoprim) led to the identification of acybolins (Fig. 1) , new natural products that combine the bactobolin scaffold with a peptidic linker and a 3-hydroxydecanoyl group [11, 37, 76]. The network facilitated the identification of eight additional acybolin variants, the structures of which could be elucidated using a combination of HR-MS/MS and NMR. Similar applications of MS/MS networking have been carried out with many other bacteria. Variations on the theme have been developed as well, for example by combining MS/MS networking with natural product databases (such as GNPS) or bioinformatic methods (i.e. RiPPquest, NRPquest, Pep2Path, peptidogenomics, or glycogenomics) to afford a discovery pipeline for linking natural products to BGCs, thus further enhancing the method’s reach [32, 33, 49, 50, 51, 58, 84]. MS/MS networking and its variations provide an effective tool to address the second key challenge noted at the outset, the divergent nature of secondary metabolism. As the accounts above demonstrate, methods for inducing silent BGCs and structurally characterizing divergent natural products have already been developed. Rutledge and Challis have provided a useful summary of available approaches for induction of silent BGCs and divided them into pathway-specific and pleiotropic . The pleiotropic methods—which include variation in growth conditions, engineering of the transcription/translation machinery, manipulation of global regulators, and epigenetic perturbations [45, 62, 74]—can in theory provide a glimpse of the global secondary metabolome of microbes. The simplest among these, variation in growth conditions, can be grouped into three subcategories: OSMAC (One Strain-Many Compounds), co-culture, and HiTES [8, 46, 56, 63, 68, 82, 85, 96]. Zeeck and coworkers provided an early proof-of-concept of the OSMAC strategy by demonstrating that alterations in growth media components induces numerous cryptic metabolites or enhances the production of lowly-produced natural products . Craney et al. conducted a more systematic search for compounds that alter secondary metabolite synthesis, focusing on actinorhodin production in S. coelicolor, which as mentioned above, could be monitored colorimetrically . One of the best elicitors identified from a library of ~ 30,000 candidate compounds, the so-called antibiotic-remodeling compound 2 (ARC2), was pleiotropic. Not only did ARC2 enhance actinorhodin production, but it also up- or down-regulated production of other secondary metabolites in a handful of other actinomycetes, in some cases turning on otherwise silent BGCs. As detailed above, we have identified low-dose antibiotics as pleiotropic elicitors in Gram-negative and Gram-positive bacteria using the HiTES method. A third approach that alters the environment of a microbe is perhaps one of the oldest in triggering cryptic metabolite biosynthesis, co-culture screens [56, 63, 68]. Early demonstrations of bacterial-fungal or bacterial–bacterial interactions, dating to the late 1970s and the 1990s, provided examples of appearance of otherwise cryptic compounds or bioactivities only in co-culture (though the term ‘cryptic’ was not used at the time) [28, 48]. More recently, the combination of imaging mass spectrometry (IMS), either via MALDI-TOF–MS or Nano-DESI-IMS, has provided a spectacular view of the secondary metabolomes of binary co-cultures on agar surfaces or of microbial communities in an ecological setting [38, 79, 82, 87, 93]. While additional methodological advances are necessary, the results obtained from these and other studies demonstrate that charting a global map of bacterial secondary metabolomes will be feasible in the near future. Even with the successes of the strategies described above, there is still room for improvement and innovation. For example, most, if not all methods, for inducing silent BGCs use challenging genetic manipulations, culturing conditions, or molecular biology techniques that slow down the pace and throughput of cryptic metabolite discovery. The creation of genetic reporter constructs required for HiTES, for example, not only diminishes the pace but also limits the broad applicability of the approach, as some actinomycetes are difficult, if not impossible, to manipulate genetically. We sought to side-step genetic manipulations altogether and recently developed an IMS-coupled HiTES workflow, referred to as HiTES-IMS for short : a wild-type organism was subjected to high-throughput elicitation using a library of small molecules. Rather than detect induction of an isolated gene cluster using genetic reporter assays, laser ablation electrospray ionization (LAESI)-MS was used to detect all metabolites produced in response to 502-member small molecules library. We chose IMS over HPLC–MS because IMS, upon method optimization, allowed us to image all 502 conditions in 1 day. We chose LAESI-IMS over other IMS approaches as it combines a soft ionization method with broad molecular coverage and minimal sample preparation for both solid and liquid cultures [41, 54]. The use of HiTES-IMS was demonstrated with Gram-negative bacteria (Pseudomonas protegens and B. thailandensis), streptomycetes (i.e. Streptomyces canus and S. avermitilis among several strains) and other actinomycetes (Amycolatopsis keratiniphila and Amycolatopsis orientalis among others). The method is broadly applicable to any culturable bacterium or bacterial consortia. Using HiTES-IMS, nine novel cryptic metabolites from S. canus and A. keratiniphila were reported. We discovered the canucins, novel lasso peptides with one variant containing an unusual β-OH-aspartate residue (Fig. 1) [25, 44, 91]. We identified the keratinimicins, a new group of class II glycopeptide antibiotics (GPAs) with an activity profile similar to that of vancomycin [27, 30, 60, 65]. Lastly, we characterized the keratinicyclins (Fig. 1), a new chemotype combining the aromatic crosslinks of the GPAs with an oxazolidinone found in the antibiotics linezolid and tedizolid. Keratinicyclin B exhibited modest antibacterial activity, but strong antiviral properties, 20-fold more potent at inhibiting the growth of the human pathogenic RSV (respiratory syncytial virus) than ribavirin, the clinical drug currently used against RSV infections . A typical output of HiTES-IMS with A. keratiniphila is shown, where the m/z of each metabolite detected is plotted as a function of IMS intensity and the elicitor from the small molecule library, yielding a 3D plot (Fig. 5) . Note that HiTES-IMS allows for high-throughput identification of inducers and products of silent BGCs. Whereas our previous renditions of HiTES measured the expression of one BGC at a time, the HiTES-IMS approach allowed us to monitor all detectable natural products simultaneously, in response to ~ 500 different conditions. Several features delineated before were also evident in the 3D plot: the pleiotropic nature of elicitors is immediately recognizable as some elicitors appear to give rise to multiple cryptic metabolites. Moreover, antibiotics or cytotoxic compounds could again be identified as elicitors; dihydroergocristine, a toxic, plant-derived indole alkaloid, for example, was a potent elicitor of keratinimicin and keratinicyclin biogenesis. Perhaps more importantly, the image in Fig. 5 represents a snapshot of the global secondary metabolome of A. keratiniphila. The combination of elicitor screening and IMS can thus provide an image of all secondary metabolites detectable by MS. While this does not capture all compounds present, it is a good representation of the global secondary metabolome of A. keratiniphila as it measures production of a sizeable range of metabolites using a detection method with broad molecular coverage under 500 different conditions. Annotating this metabolome, using MS/MS networking and other approaches, would provide a comprehensive picture of the full biosynthetic potential of this prolific microorganism. The global secondary metabolome of A. keratiniphila as determined by HiTES-IMS. The color bar shows IMS intensity. “b. thr.” denotes below IMS intensity threshold. Note that the growth and work-up conditions ensure that predominantly secondary metabolites are imaged by this approach (color figure online). Primary and secondary metabolism are fundamentally different. The essential nature of primary metabolism has facilitated its investigation over the past century and delivered a comprehensive, detailed picture. This kind of understanding is not yet available for secondary metabolism. The two key roadblocks in obtaining a similarly detailed image is the predominantly silent and divergent nature of secondary metabolism, which together render the products of many pathways undetectable and complicate structural and functional studies of those molecules that can be detected. Over the past decade or so, new approaches have been developed to address both challenges. HiTES is one of several methods that can access the products of silent BGCs. In doing so, it has provided a surprising link to antibiotics, highlighting their stimulatory, hormetic, and pleiotropic effects on secondary metabolism [73, 75]. Specifically, applications of HiTES in diverse bacteria has shown that low doses of antibiotics stimulate and enhance the secondary metabolic output of a bacterium, while high concentrations of the same antibiotics kill [73, 75, 89, 91]. Bacteria have developed stress responses to respond to low doses of antibiotics by activating silent biosynthetic pathways. The details of this response, the molecular mechanisms underpinning it, remain to be established. Because in many cases the antibiotic-treated bacteria respond by synthesizing their own antibiotics, studies with HiTES have led to the idea that old antibiotics may be utilized to find new cryptic ones . In addition, in the cases studied thus far, metabolomic studies have shown that low doses of antibiotics induce not just the target silent BGC, but rather secondary metabolism on a global level. Future studies will certainly aim to identify the mechanisms underlying this pleiotropic response. With workflows at hand to expose the hidden metabolomes of bacteria, the focus will shift on the ability to deconvolute the complex “induced” metabolites, both structurally and functionally. While there is still a need for innovation in this area, promising methods have been reported and established ones exist to rapidly identify, dereplicate, and annotate complex secondary metabolomes [22, 57, 86, 87, 88, 92]. MS/MS networking is especially useful in identifying structures of analogs of known compounds and in prioritizing the search for new ones. Indeed, the technological progress in recent years has advanced methods that can meet both key challenges noted above in studying secondary metabolism at a systems level. These approaches, in conjunction with innovations that are sure to follow, promise to deliver new natural products, which would aid drug discovery, biosynthetic inquiries, and functional investigations, toward a holistic picture of bacterial secondary metabolomes. My sincere thanks go to Richard Baltz for inviting me to write an article for this special issue, to Chris Walsh and Heinz Floss for their seminal contributions to natural product research and beyond, to members of my group who contributed to the work described in this Perspective, and to the National Institutes of Health (DP2-AI-124786) for finanacial support.